The absence of rain gutters on the 100 Series Land Cruiser meant a whole new approach to roof rack design and fit. 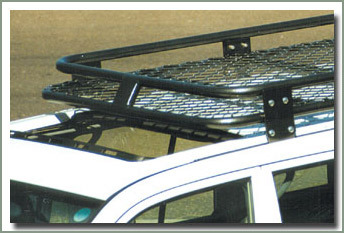 The Alloy Roof Rack to suit the 100 Series Land Cruiser features a robust stainless steel mounting system utilizing the factory mounting points for effective fit and superior load carrying. This new style of rack is also lower in profile for better wind cheating and more clearance in your car accommodation. Includes mounting hardware. They have a Silver Hammertone finish. The powder coated finish products go through a 4 step preparation process. Once fully prepared they are then powder painted with the required powder coated finish via an electro charged dry powder painting process. When they are fully painted, they are then baked in a specially designed powder cure oven at temperatures in excess of 230 degrees. This process ensures that your product is fully protected from the elements and the finish is there to stay, providing you with continued long lasting presentation and performance. While offering superb eye catching appearance, the attractive and durable textured powder coated finish requires virtually no maintenance. 78 inches x 50 inches-Silver Hammertone Finish-Fits 1/98-2007 100 Series-Comes with installation hardware. This is a large item. Must be shipped by truck freight. Call for quote.